Not only is a strong body needed to be a goalkeeper, but a strong mind as well. Over decades of development a keeper’s skills must become instinctual. Truly the last line of defense and the first line of attack, the goalkeeper has a unique skill set in soccer. 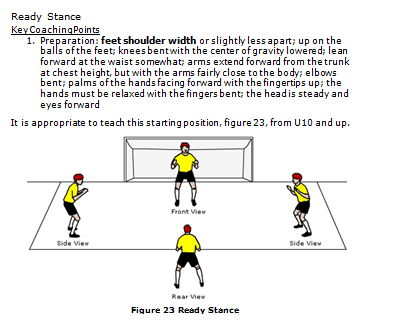 It is appropriate to teach this starting position, figure 23, from U9/U10 and up. Apart from the penalty kick the goalkeeper is rarely found stationed on the goal line in the goalmouth. The keeper must constantly reposition to an angle facing the ball, figure 28. Once the goalkeeper gets into a good angle to the ball he or she must take up a good body posture to better execute a skill to make a save. This means the right ready stance as in figure 23 is required. Furthermore footwork is a vitally important aspect of goalkeeping. It is the feet that get the hands to the ball. A keeper might have very good catching skill, but that talent is wasted if the keeper cannot move quickly to the ball. Ultimately the goalkeeper should be able to move smoothly in all directions; laterally (post-to-post), forward (straight and diagonally) and backward. Play 2v1 + GK in a 30 x 30 yard area with a 6′ x 18′ goal (8′ x 24′ for U14) at one end. Two are attacking field players; the one is a defender and a goalkeeper. The attackers pass among each other and try to score. They should try to shoot from the side forcing the goalkeeper to narrow the angle to stop the shot. The attack earns 1 point for a goal scored head-on and 2 points for a goal scored from either side. The keeper earns a point for every save made. Rotate the goalkeepers every ten shots. Whenever possible the goalkeeper should move to get the body behind the hands and ball as a second barrier in case a clean catch is not made the first time. Any catch (save) made between the ground level and head height has the body behind the hands as insurance in case a ball slips through the hands. Any ball above head height does not have that secondary barrier. So the progression in teaching catching shots to young goalkeepers must be from the ground to above head height so that their confidence and technique in catching can improve before they must deal with the difficult above the head ball. In a 20 x 15 yard grid play 2v1 with an age appropriate goal on one end line. While passing between one another 2 attackers try to score on the goalkeeper. The keeper is given points for a clean save (scoop it for a low shot 2 points or catch it for a high shot 1 point). The attackers earn a point for each goal scored. Keep score between the attackers and the goalkeeper. After a save or a goal play is restarted by the keeper tossing the ball back out to the attackers. Rotate the player in goal after five shots. Once the goalkeeper has taken possession of the ball, he or she must attempt to use it in a way that an attack on the opposite goal can be set up. 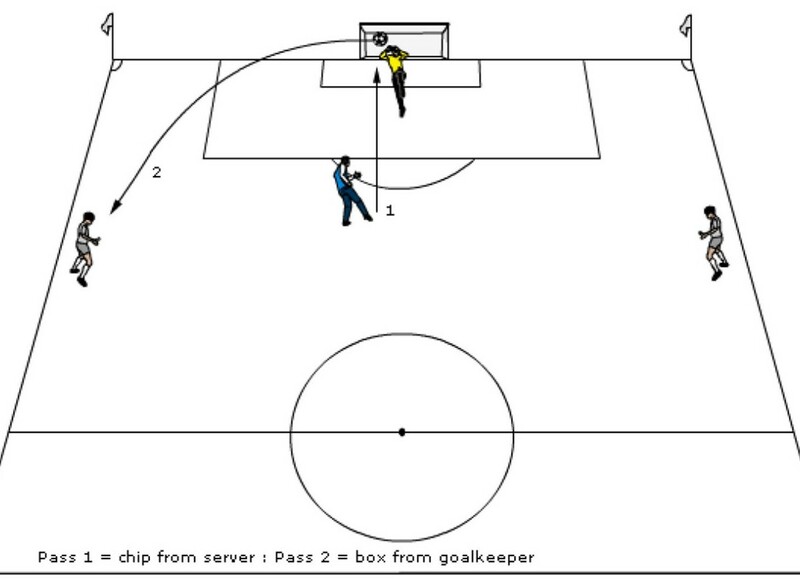 The keeper must give the distribution (pass) the same tactical considerations as any player. This means that the ball must be thrown or kicked so that it can be easily controlled when passed over short distances or so that it gives teammates an advantage when played over long distances. Play 3v3 in a 30 x 20 yard grid with a goal at one end. The attacking team earns a point by intercepting a distribution by the goalkeeper and by scoring goals. The defending team earns a point each time they can control a distribution by their goalkeeper. If the defenders gain possession the game stops and the attackers resume regaining the ball at that spot in the grid. Play 5 to 10 minute rounds depending upon the age group. 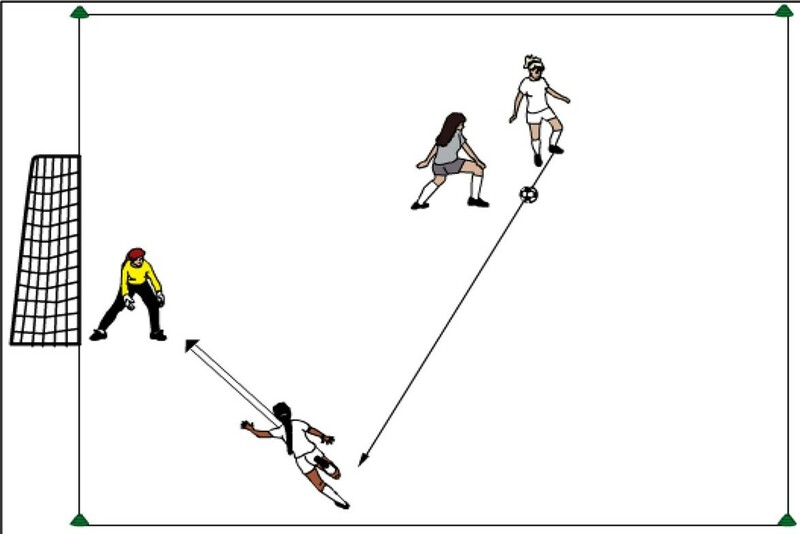 Variation: any player who catches the ball while making a save is then the goalkeeper and gets to throw the ball out or utilize a keeper as one of the players on the defending team. Set up a 25 x 20 yard grid with a 4 yard wide goal on one end and play 2v3. One of the three defending players goes in goal. The defending players take turns playing in goal. The attackers try to score goals to earn points. If the goalkeeper makes a save then distribute by bowling the ball to a teammate. If the teammate is able to control the ball from the distribution the defending team earns a point. For U5/U6 & U7/U8 play 3v3 and any player who catches the ball while stopping a shot is then the goalkeeper and gets to bowl it out. To increase the chances for successful bowling of the ball add an extra player to the defending team. This is a technique that is often taught incorrectly resulting in goalkeepers punting for height rather than distance. 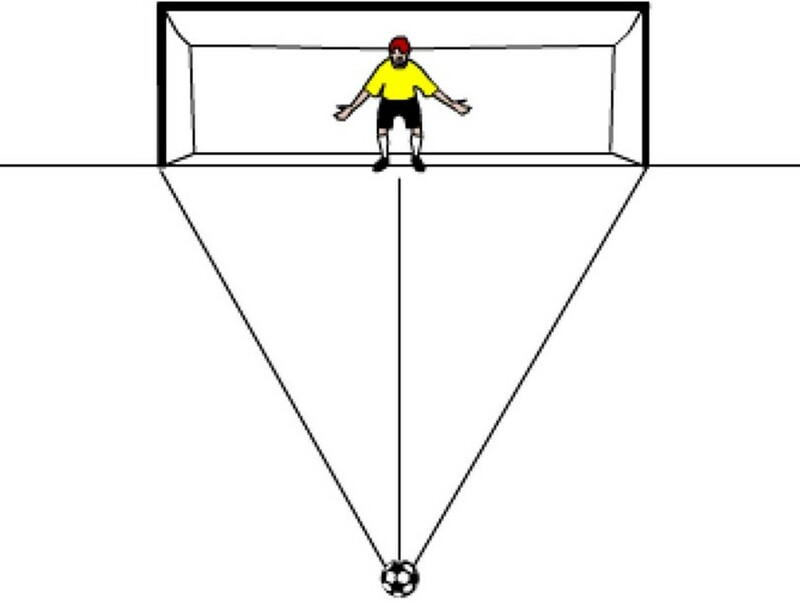 If the keeper hits the ball well below line A then the ball will go too high and lack distance. The tactical intent of punting the ball is to gain maximum yardage for a breakaway or to relieve pressure from the defense by sending the ball as far away from the defensive third as possible to buy time to reorganize. In both cases the punt needs a height of only about ten to twelve feet. Distance can be added to the punt as well as height by driving forward through the ball with the kicking foot to give the ball a trajectory angle of approximately 45°. The training area is 40-60 yards long and 30 yards wide. The goal is 6-8 yards wide depending upon the age group involved. Play 3v3 with the defending team designating one player as goalkeeper. The attackers earn points by scoring goals. The defenders earn points from saves made and successful punting of the ball into the zones. 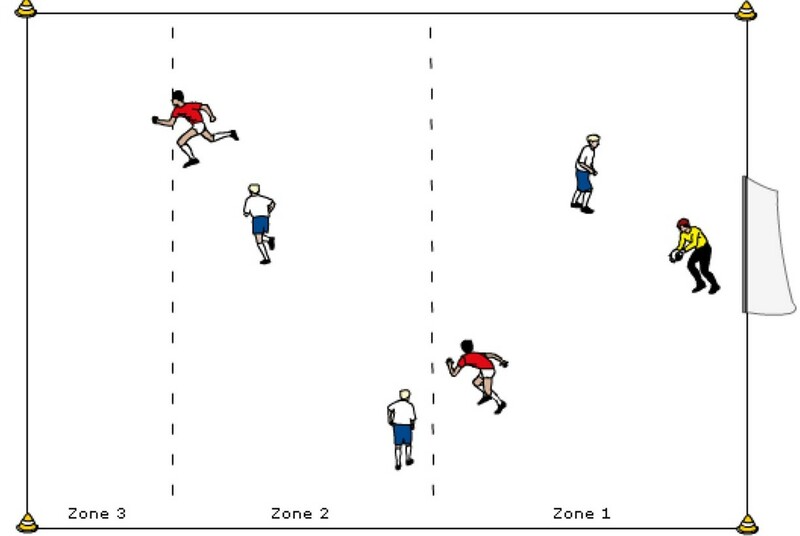 One point is given for a ball landing from the goalkeeper’s punt in zone 2 and two points for landing in zone 3. One additional point is earned for any punt controlled by one of the goalkeeper’s teammates. Play two minute rounds. At the beginning of each round the defending team has a new keeper from its group of three. Same as for clearances made by other players as described in the section on passing. In the defensive third of an age appropriate size field the coach sets up at the top of the penalty area arc. The goalkeeper starts in the goal area. Two target players position themselves near on either flank of the defensive third. The coach serves the ball in the air to the goalkeeper via an underhand toss or by chipping the ball. Each time the goalkeeper should come out to the ball to meet it at the highest point possible and punch it to one of the target players. The goalkeeper decides to which side of the field to punch the ball based on the original flight of the ball. One dozen services equal one round. Goalkeepers should alternate rounds. To practice single fisted punches of a ball coming in from the side the coach should serve from the side of the penalty area and the target players should move closer to the goal line. Once the goalkeeper is comfortable with both double fisted and single fisted punches add an opponent for realistic pressure. When a shot is going just outside the goalkeepers reach for a safe catch then deflecting the ball around a goalpost or over the crossbar is the next choice. It is better to push the ball out-of-bounds and give up a corner kick than to make a partial save where the keeper is unlikely to be able to hold the ball and it is now loose and still inside the penalty area. Whenever possible use the heel of the palm of the hand to deflect, but often only the fingers will reach the ball. When a ball is turned around a post it is almost always done so at the end of a dive. The grid should be 20 x 20 yards with an age group regulation goal on one end. A second smaller goal is made with corner flags inside the grid 6 yards forward of the regulation goal. The second goal should be at least 2 yards more narrow than the regulation goal. There is a goalkeeper in each goal. A shooter is in front of the smaller goal; 8 to 10 yards away. A second field player is in the area between the two goals. The coach is just outside the grid with spare soccer balls. A ball is played to the shooter who may shoot first touch or dribble and then shoot. He is shooting at the smaller goal. The keeper here attempts to make the save. If the ball gets through the first goal then the goalkeeper in the second regulation goal must make the save. The second field player in front of that goal may try to redirect (deflect) the ball. The goalkeepers should switch roles after eight shots. The field players should switch roles after 5 minutes. Keeping in mind the principle of “narrowing the angle” the goalkeeper should exert every effort to meet the opponent as far away from the goal as possible. Divide the team into two groups. Play in one half of the field. Both goalkeepers are at one goal and take turns in goal. One group of field players is behind the goal collecting the balls that go out-of-bounds and returning them quickly to the other group. The second group is staged in a grid 30 yards from goal. One at a time they attack the goal, thus setting up a one-on-one with the keeper. The next attacker may go after a shot has been taken. The attackers get a point for each goal scored and the goalkeeper gets a point for each save made and two points for taking the ball off the attacker’s foot. The goalkeepers and attackers switch places after one minute. Keep score between the two groups of attackers and the two keepers. In diving the three phases of preparation, contact and follow through are replaced with takeoff, flight and landing. Just as with flying a plane the most important part is the landing, so teach this phase first. Next in importance is the take-off; then the flight. However the three phases will be presented here in the order in which the skill is actually done. Some definitions will aid the coach and player in learning the skills of diving saves. If the ball is deflected after the goalkeeper has already committed to a dive than a kick save may be required. The change of direction of the path of the ball could come from a shot or pass rebounding off a player or deflected by an uneven surface or a skip off of wet grass. If the goalkeeper’s diving form is correct with the legs parallel to one another and not crossed over each other then there’s a chance to clear the ball with a kick. This save may suffice or at the least gain the keeper time to get back onto his or her feet. With all dives using the muscles of the arms, shoulders, upper back, chest and abdomen to control the landing is important to maintain control of the ball upon impact with the ground and to reduce the likelihood of injury. Psychologically teach novice goalkeepers that this is a safe landing not a crash landing. DIVING – TEACH HOW TO LAND, THEN HOW TO TAKEOFF AND THEN HOW TO FLY. THE DIRECTION OF THE DIVE SHOULD BE PRESENTED IN THIS ORDER: FORWARD, LATERAL AND THEN BACKWARDS. THE HEIGHT OF THE DIVE SHOULD BE PRESENTED IN THIS ORDER: COLLAPSE, LOW, MEDIUM AND THEN HIGH. Two teams of 3v3 play around a triangular shaped goal. Each side of the triangle has a goalkeeper. The two teams play against each other and try to shoot past one of the goalkeepers. If a keeper makes a save he or she distributes to the other team out towards the edge of the grid. The goal sizes should be based on the age group. The grid should be 25 x 25 yards. Rotate the players in goal with one of the teams after five minutes. Play until all nine players have been in goal.